Houston died on the eve of the Grammys at the Beverly Hilton Hotel, where she was preparing to attend a pre-Grammy party. Her death cast a huge shadow over the event. As the pre-telecast awards ceremony began, co-host Dave Koz acknowledged the tragedy, noting the "great legacy of Miss Whitney Houston. She's in our hearts and our minds". Presenter Jimmy Jam, a friend and producer of Houston's, said it "a bittersweet occasion tonight with the passing of Whitney. "Anytime someone passes away, the thing you do is you gather your family together, tell stories," he said. "A little bit of mourning, little bit of celebrating - this is our family tonight and we're going to do it the best that we can do it." Melanie Fiona, who won best traditional R&B vocal performance and best R&B song with Cee-Lo for the song Fool For You, also gave tribute to the fallen star: "Whitney Houston I would not be standing up here if it were not for you, thank you so much." A moving moment came when Tony Bennett won his second Grammy of the evening, best pop performance by a duo/group, for his collaboration with the late Amy Winehouse, Body And Soul. Bennett, who also won for the album Duets II, brought both her parents, Mitch and Janis Winehouse, on-stage to accept the award. "We shouldn't be here, our darling daughter should be here. These are the cards that we're dealt," Mitch Winehouse said. "We miss our daughter so much." Winehouse also referenced the deaths of Houston and Etta James, saying: "There's a beautiful girl band up there in heaven." 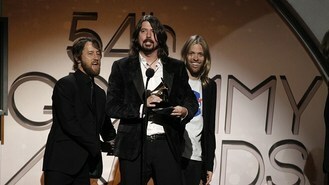 When it came to the business of awarding trophies, the Foo Fighters were the top winners in the pre-telecast ceremony, taking four out of their possible six trophies, including best rock album for Wasting Light. Kanye West and dance/electronica DJ Skrillex won three each. Adele captured two of her six possible Grammys, including best pop vocal album for 21, while Taylor Swift also won two trophies for her rebuke to her critics, Mean.